The year was 1517. A monk named Martin Luther gripped his hammer and nailed a list of biblical grievances against the Roman Catholic Church to the door of Castle Church in Wittenberg, Germany, much like we might post a notice to a community bulletin board today. These 95 Theses protested the Catholic Church’s unbiblical policy of selling indulgences, part of an effort to raise funds for the building of St. Peter’s Basilica in Rome. The Catholic Church had created the idea of the Treasury of Merit, sort of a “bank account” of merit deposited by Christ, Mary, the saints, and others as a result of their good works. When church members sinned, they could purchase an indulgence, which was akin to asking the Church to “transfer funds” from the Treasury of Merit to the sinner’s account. The indulgence basically excused the sinner from a certain amount of time in purgatory and/or temporal punishment for that sin. One of Luther’s most cherished ideals, from which we still benefit today, was that common people should have access to both the Scriptures and worship services in their own language. 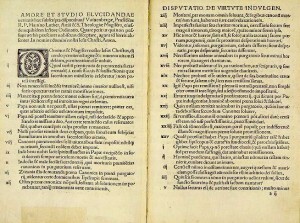 Prior to the Reformation, the Bible was only available in Latin. Likewise, all masses and other church services were conducted in Latin. Luther translated the Bible into German, and was later followed by William Tyndale, Myles Coverdale, David Brainerd, and others who translated the Bible into various languages. On Reformation Day, we commemorate the work, zeal, and sacrifices of Luther and the other reformers. Reformation Day is observed on October 31.